This week we begin a new four week series including the readings over the next four weeks. The series is called; “What do you want?” It is the question Jesus asks Bartimaeus who is blind and seeking Jesus’ assistance. It is a question Jesus asks all of us. So as we start it would be good if you take some time and reflect on what it is you want. God, the creator of the universe stands ready to answer your request. So what do you want? 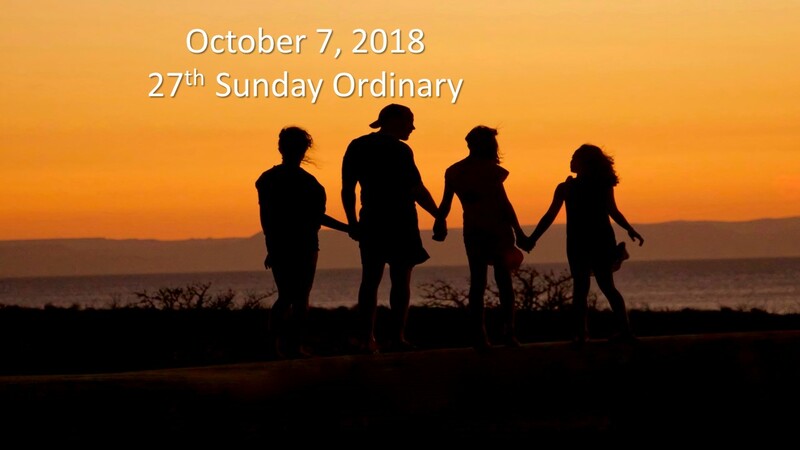 The readings this week are from the Lectionary for the Twenty-Seventh Sunday in Ordinary time; We begin with; Genesis 2:18-24; Psalms 128:1-2, 3, 4-5, 6; Hebrews 2:9-11 and Mark 10:2-16. As we look at the question to each of us, what do we want, the readings show that even before the creation of us God was already answering the question. God does not want us to be alone, in fact God wants a kingdom where we are all one. The message of common origin, common place of rest and common desires come through as a theme in the readings referenced. Let’s see how. The reading from Genesis recalls the story of God recognizing after the creation of the first human, Adam, that human beings should not be alone. Human’s desire and require companionship and community. God puts Adam asleep, removes a rib and creates Eve, the first wife. Adam recognizes immediately that Eve is the one, and that together they become one. This unity, the creation of an everlasting bond is a key message from this story. Written with some time in the rear view mirror we are told humans leave their mother and father and cling to one another, becoming one flesh. Written from the perspective of a larger society, we see joining man and women as one has long been in place, making the relationship between spouses more important than the relationship between parents and their children. In fact we can say, this relationship serves better than any other relationship for creating what people want. The reading from Hebrews refers to Jesus entrance into humanity. Jesus came for everyone, and died for everyone. It is through Jesus that all things exists and he intends to bring “many” of us to glory. Jesus took upon himself the divine action to be a pioneer for salvation. Jesus the one who “consecrates” or rather the one who declares sacred, and those consecrated (us) have one origin, thus we are brothers and sisters from the beginning. Jesus is in solidarity among all humankind, sharing in our humanity and we share in his divinity. From the beginning we are all from the same place as Jesus and the work of Jesus is to bring us back to full glory with him. Being all of one origin, we are all together even before we are born, and Jesus’ hope is that we return all together after we have lived. Unity is natural based on our origin story and our journey to glory. We are meant to be together, in fact we need each other. The reading from Mark tells the story of Jesus being questioned by the religious leaders of the temple, about divorce. They say Moses allows divorce in the law. Jesus responds it is true, but in the beginning this was not how God intended it. Jesus refers back to the scripture we have in the Genesis reading and reminds them that God made man and woman and they are no longer two but one flesh. “What God has made one, no man can un-one.” @AndyStanley Jesus goes on to say anyone who divorces and remarries is an adulterer. The reading has a part two about children who wanted to be near him. He uses their excitement as a way of describing how we should desire the kingdom, this unity we have been discussing. Jesus says we should accept God’s kingdom with the excitement and enthusiasm that the children have trying to reach him. In our desire to be in the kingdom, not alone, we should be as enthusiastic about this uniting as a young children on the night before Christmas. What do we want? These readings give us a high priority answer to our question. Even before we can say what we want, God is showing us what we need. We need to be together, we need one another, we need each other. We all come from the same origin, we are of the same flesh, we are united as one in marriage, we are consecrated by Jesus as one vast community, we are saved as one with our Savior, and we are many moving toward the glory Jesus provides. Although we are unique individuals, we are one, originally one, saved as one, and end up together. We cannot be alone. What do we want? We do not want to be alone. In fact we are made to be together. We each have our own story. We start similarly, in our mother’s womb. We are born and hopefully started life healthy and well. For many of us a new baby is a uniting force. We grow up, we have good times and bad, we have emotional ups and down, we struggle to achieve, to be happy, in fact to live can be a struggle. At some point we break out on our own, becoming responsible for who we are and what we do. It is then we might think our life really begins. We might get married, start a career, develop patterns that become our routine, what our life becomes. It is rare that we do any of this alone. Growing up we have friends who influence us. Later we develop more intimate relationships that can turn into partnerships that set the stage for the rest of our lives. Myself, I followed this pattern, a son with four sisters, with parents that created a good life for us. I left home for work, met a wonderful lady and we married, I still am blessed to have her every day in my life. Together we had three beautiful girls, who have blessed us with six beautiful grandchildren. I was fortunate to have talents in software engineering and had a great career at a big software company. I was able to retire young. Having been influenced by Jesus earlier in life, in retirement we set out to try and do the work of Jesus. We went to a community called l’Arche which put the gospel message at the center along with people with special needs. We returned to be full time in our church. And today are still working in the church to spread the word of Jesus for others. Believing it has given us a better life. The journey through life has many paths. We all have different talents and interests. But common through all of these is our desire for companionship and community. We want someone to recognize us. To say hey what you are doing is beautiful and I appreciate it. What good is it to create a great success, a beautiful picture, the most amazing song, the best architecture, the best love story, the most delicious recipe and on and on if no one sees it? Of course in humility we may not say we are looking for prizes, but just for someone to see and say, it is beautiful. We are made in beauty and what we have to offer is beautiful, God sees it, and in life we are lifted up when others see it too. When we are together Jesus teaches us to serve one another. We want to be appreciated when we do something and we should also appreciate one another. A couple of times a year I would attend a day of refreshment for people who have a physical disability at a local church. It was a day that was all about these special people, enabling them to reflect spiritually on their life while enjoying some good food, and making new friends. Each of us able-bodied people were partners with someone with special needs. We were present to lift any physical obstacles to their time of spiritual reflection. The particular day I am speaking about I was with a young man, in his mid-twenties, confined to a wheel chair. He had scars from being in a fire, when he spoke it was very difficult for him, it was also difficult to understand him. He had been in a car crash in his early twenties and was lucky to be alive. His name was Jack. We spent the morning together, I helped him eat a breakfast juice and donut. We listened to speakers, followed their instruction and performed tasks meant to help him reflect on his spiritual journey. I was his hands and legs. He was a beautiful young man and I enjoyed him. Nothing I was doing was particularly difficult but my presence was important for him to participate. At lunch time I served him his meal, needing to hand feed him every bite and bring his drink toward him with a straw. I would get to anticipate his pace and when he needed a drink. By the end of the meal we were symbiotic working together for him to enjoy his lunch. After lunch there was more talks, tasks and reflections provided by people leading the day. All day we sat together at one table with other people who made up our little group. At one point there was an afternoon break and Jack initiated a conversation, this was a first. Throughout the day, I would ask him questions and he would respond. If I couldn’t understand what he was saying he had a spelling board that we could use to craft words and sentences. So though it was difficult to understand him, with context and help we could communicate. But this was different. Jack began to speak and I had no idea of the context or what he was trying to say. I politely listened and nodded my head, but couldn’t understand. He spoke several words and I looked at him and apologized saying I didn’t understand. He tried again, I didn’t get it again. After a few attempts I decided I would just look at him and smile and hope that satisfied him. But, it did not. He knew me enough to know I didn’t get what he was trying to say and he would grab someone who was passing by and say it to them. Still nothing. Now the people at the table were trying to help. No luck. I was beginning to have the unfriendly thought of wishing I had told him I got it right away and we wouldn’t be stuck here. But stuck we were. Jack continued trying to say what he wanted me to know and I along with others from the day, even people who knew him prior to today couldn’t understand. We tried to use the spelling board but even with this mechanism we couldn’t get what he was saying. We were stuck, I was having regrets, thinking I was letting him down. But Jack persisted. He began spelling the words by voice and slowly and finally what he wanted to say came through. He said, “I am very happy that I met you today.” He was looking into my eyes, with a big smile and when I finally got it he was watching my tears. It was so beautiful and so meaningful to me, that I never forgot it or him. I never saw him again, although I tried. It was more than twenty-five years ago and when I remember it I still tear up. I am so happy he didn’t give up trying to tell me and he didn’t let me give up trying to hear him. Our presence together was anything but news worthy but we connected. I know he made me feel special and I always hope I did the same for him. In life we have these moments, we make connections, and we help one another. We are not meant to be alone, we need one another. We are also told to serve one another. Jesus said he came to serve, not be served. It is in serving each other that we learn that we too are being served and by serving we learn we are needed. God defined the relationship of Adam and Eve from the beginning as one of dependence on one another, in fact we get the impression Adam could not have survived alone. Make room in your life for others and make others important in your life. Just as an aside, there are some who want to be alone. Occasionally this can be a welcome opportunity. But being alone often, is not a good thing. I will say generally this is due to sin. Jesus in the reading from Hebrews says “many will come to glory.” He says many, not all. Jesus’ desire is that we are all together in glory, but sometimes we are corrupted and it is not what we want. It is not our desire to be with others or even to want to be together. This is the story of sin. Sin separates us from one another. By its nature a sinful act requires secrecy and privacy, it is an act committed alone. Even if we sin in a group, for example several people steal something together, each one sins on their own. In the stealing we each have our own recognition of what we are doing and what is our intent. When we sin we are saying we don’t want to be united, we don’t want to be with others, we don’t need anyone, we want to be alone. It is why we say, even one sin effects everyone. The decision to separate is in fact saying I am different, I am not from the same origin, I do not choose to be with anyone and essentially I don’t want the glory Jesus provides. It disrupts unity. So if you find yourself wanting to be alone too often, you might need to check yourself and ask why. What do we want? The question that leads this series is an important question. We should take time reflecting on the question, thinking about what we would ask when face to face with God. God does want to know our answer. But God also knows what we need. From the beginning God knew we didn’t want to be alone and so God created companions. Jesus tells us we are from the same origin and will return to the same glory. We must recognize this desire, need and call for unity and live with one another, serving one another and announcing the beauty of and to one another. Next week we’ll continue to ask the question, what do you want and see how God is trying to lead us to a better life.